Hide folders, files, disks, files by Mask My Documents, Favorites, Desktop, Internet History, Control Panel, and Data/Time setting. Supports 8 encryption algorithms. 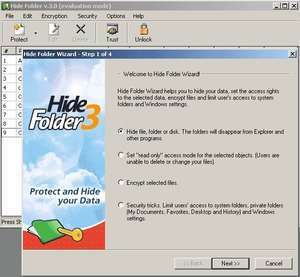 Hide Folder start up is password protected. FAT, FAT32, NTFS support.